The Monster Memories tradition continues in the 2013 Yearbook #21. The editor has decided to get to #100 more quickly so this also is considered Scary Monsters magazine #86. All new not a reprint - and available in limited quantities right here! 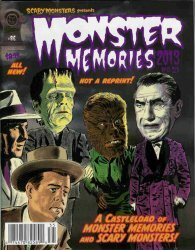 A Castleload of Monster Memories and Scary Monsters! Abbott & Costello Meet Scary 86! The Mis-Adventures of Sam Scare! ... and much, much more on 132 pages!